MediaConvert is the new Amazon Web Service for video encoding which replaces the old Elastic Transcoder. It has a better pricing model where you only pay for the encoding features which you are actually using and it supports all the new standards, such as 4K video. 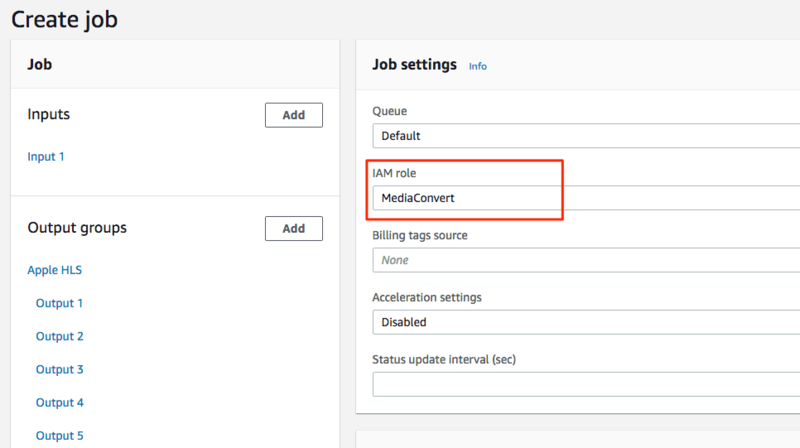 Before you start using MediaConvert you need to create the IAM Role which you will use together with it. 1. Start by opening Services -> IAM ->Roles -> Create role. 2. Pick the MediaConvert service and then just keep hitting "Next", three times. 3. 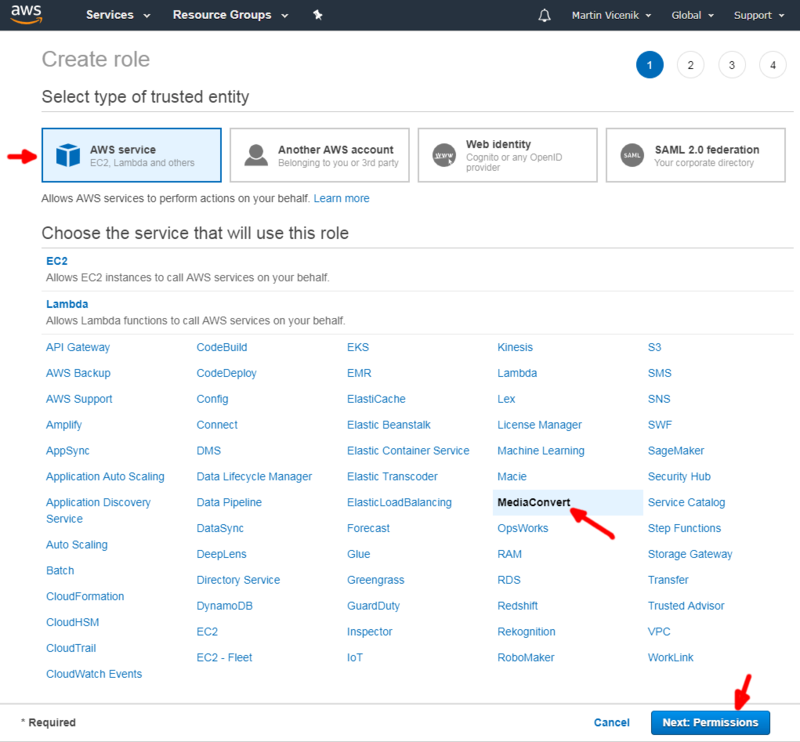 In the last step of the Create role wizard, you need to provide the name of the new role. Just enter "MediaConvert". 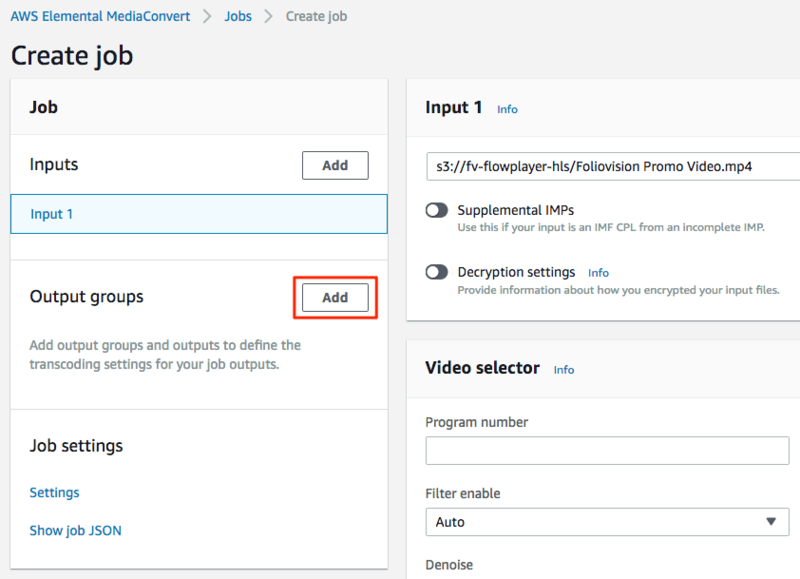 Now it's time to create your first video encoding job. Click "Create role". We assume that you have an S3 bucket in place to which you already upgraded your video in an MP4 format. Always use the highest quality version of your video, otherwise the video encoding process might degrade the quality too much. 4. 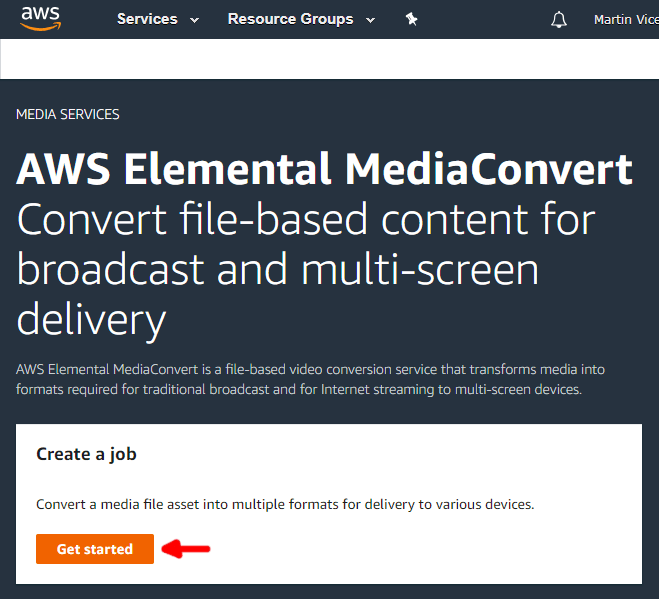 Open Services -> MediaConvert and click "Get started". 5. You will get to a screen which outlines the whole process on the left hand side, and lets you edit all the properties on the right hand side. Make sure you are in the "Input 1" section and click the "Browse" button. 6. Use the popup dialog to pick your S3 bucket and the input file. Once your file is selected click "Choose". 7. Now you need to add the Output group, so click the "Add" button, next to it. 8. Use the popup to pick "Apple HLS". Click "Select". 9. 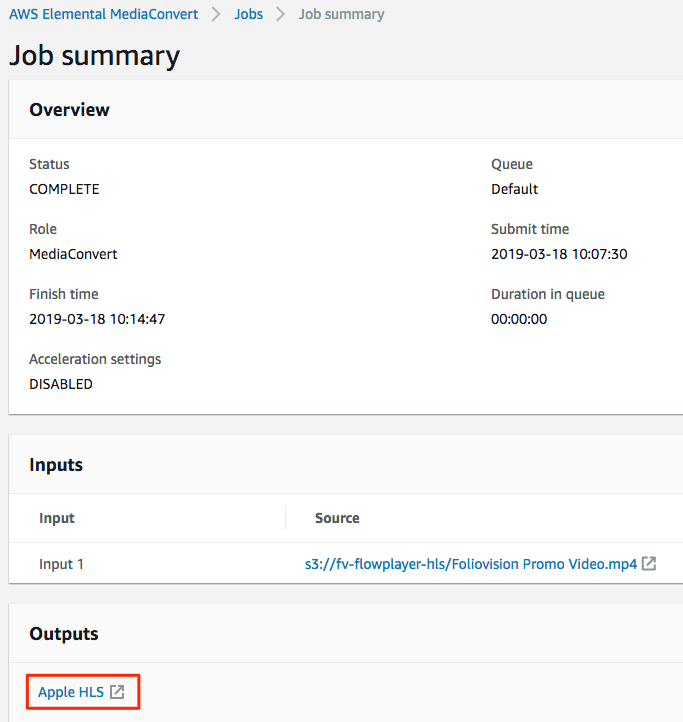 You will get to the "Apple HLS" section where you need to click "Browse" to specify the output location. You can browse through your existing folders too. Once you are done click "Choose". 11. Now that your destination is set, you need to add all the outputs. 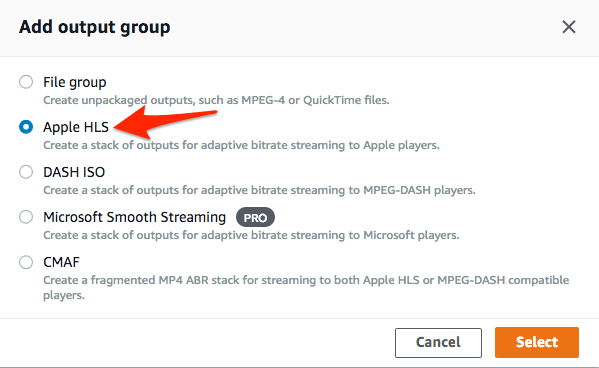 Click "Output 1" to enter information about the desired video output. 12. Pick the "Preset" and enter the "Name modifier". Just make sure what you pick matches your video aspect ratio, frame rate, and resolution. So for a Full HD video start by picking "System-Avc_16x9_1080p_29_97fps_8500kbps" and enter "-1080p" as the Name modifier. 13. 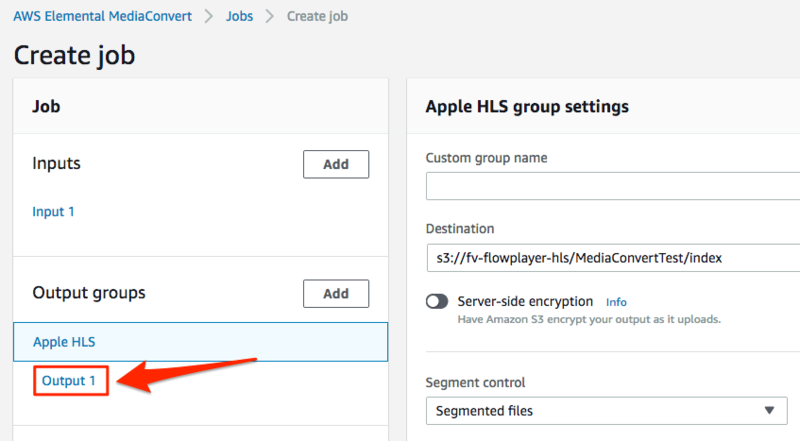 Now, click on Output Groups -> "Apple HLS" to go back to that section, and click "Add output" to add another quality. Just make sure what you pick matches your video aspect ratio, frame rate, and resolution. 15. 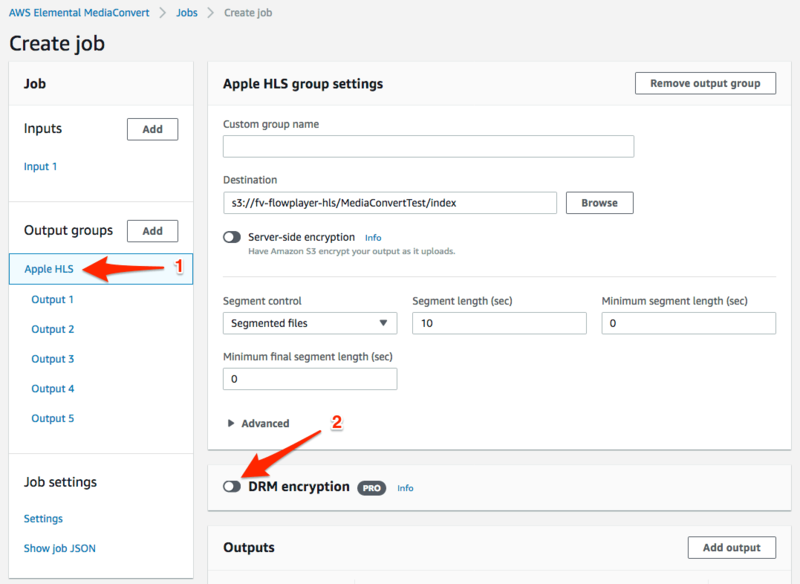 To really protect your video from downloading you also need to encrypt the HLS stream. Click "Apple HLS", then click "DRM encryption". If you don't need to encrypt your video, you can skip to step 17. If your website is using https:// then this URL needs to use https:// as well. If your website is using a domain with www. in front of it, make sure it's included as well. 17. 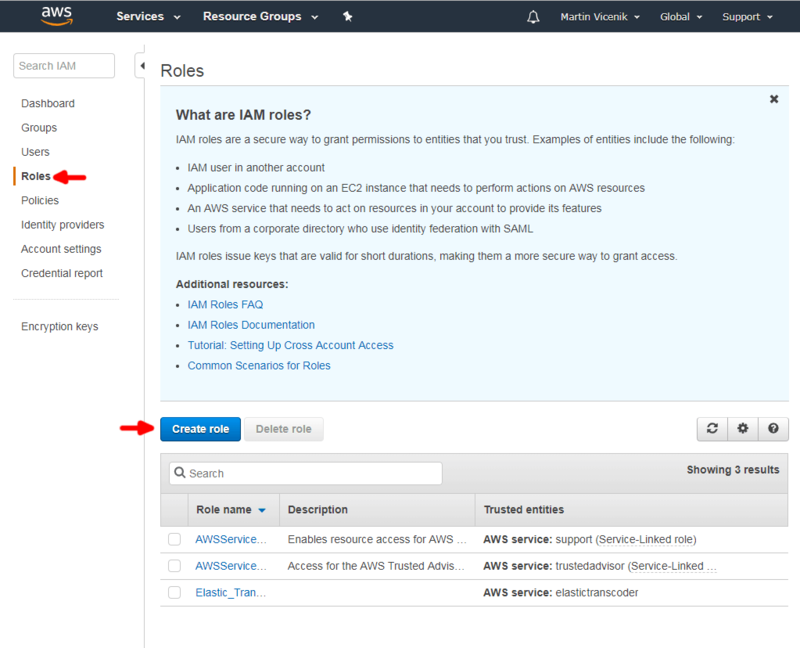 Then go to Job Settings > Settings, and pick your IAM role. 18. Scroll down to the very bottom and click "Create". 19. You will see that your job has been submitted. You can click the "Refresh" button to see if it's done yet. 20. Once it's done, you can access the folder with the encoded stream using the link in the "Outputs" section. 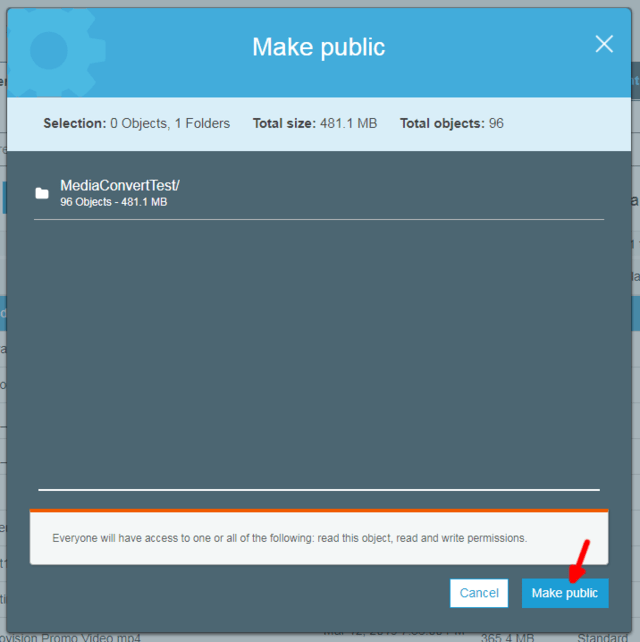 You will need to check the "Restrict Bucket Access" along with the "Grant Read Permissions on Bucket"
Fix the file permissions to make your HLS stream file publicly accessible. 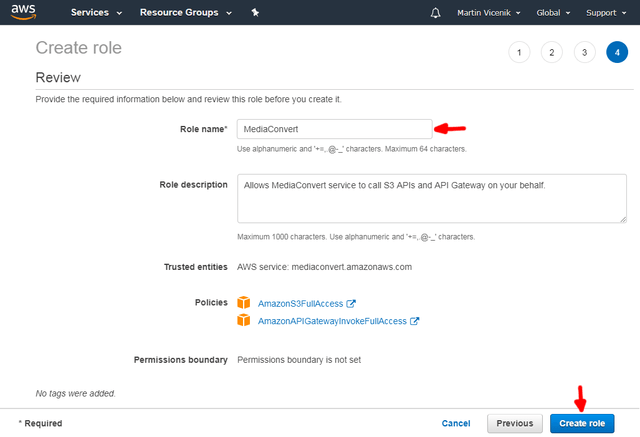 In case you are using CloudFront, you can skip to step 23. The stream file permissions need to be fixed in the S3 bucket. 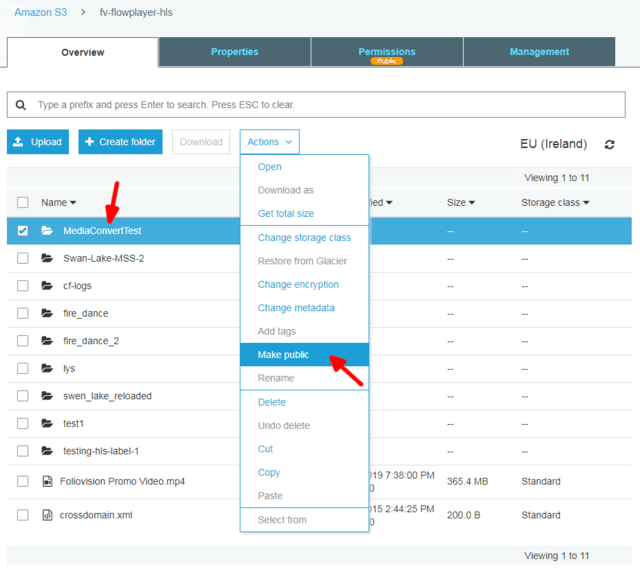 First locate the folder in the S3 bucket, right click it and select "Make public". 22. You will be asked to confirm your action in a popup box. This guide and the whole process is new, we will of course make it part of the stable version of FV Player Pro soon. But for now it's in Beta. Note that you can also used the FV Player S3 Browser feature, if you have your S3 bucket access keys set in FV Player -> Hosting -> Amazon S3. That way the URL will automatically use the proper CloudFront URL if it's set up. 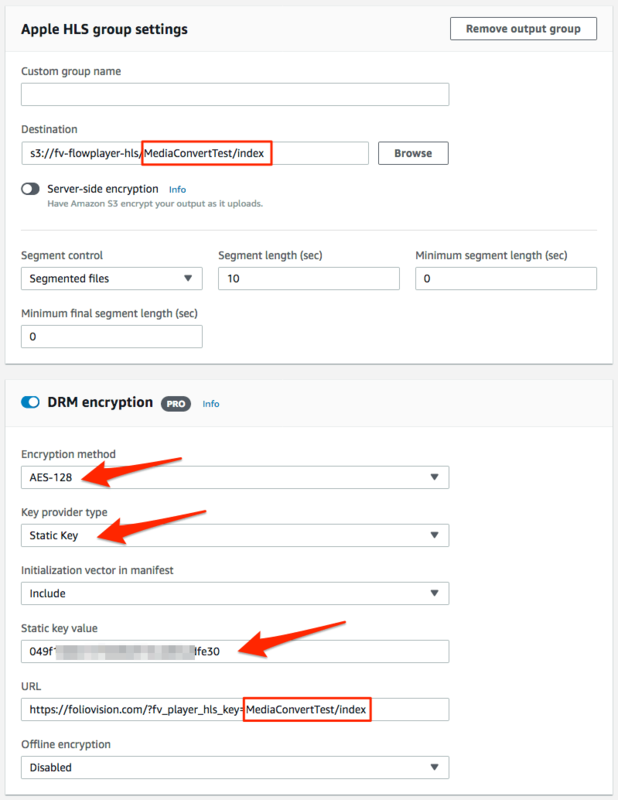 Paste in the "Static key value" from Step 16. into the Encryption HLS field. Or you can get it from the "Job summary" screen, just go to Details -> Apple HLS -> "DRM encryption". However if you use the System-Avc_ encoding presets these actually use the 2 pass encoding ("Quality tuning level" is set to "MULTI_PASS_HQ" ) which is more expensive - $0.084 for 4K video, $0.042 for each video quality at 720p and above and $0.021 for each quality below 720p. That way if you encode at 1080p, 720p, 540p, 360p and 240p you pay - $0.147 per minute which is $8.82 per hour. That is the Professional Tier which also gives you the DRM.